The verb “ To Be ” has three forms in the present; am, is and are. The verb “ To Be ” has two forms in the past; was and were. Be ( am, is, are, was, were ) + Subject + …. I am a doctor. Am I a doctor? He is from England. Is he from England? We are happy. Are we happy? She was ready. Was she ready? They were the same. Were they the same? I am studying English. Am I studying English? He is watching television. Is he watching television? We are working in the office. Are we working in the office? She was waiting at the bus stop. Was she waiting at the bus stop? They were coming to take me away. Were they coming to take me away? Am I sympathetic? Yes. / Yes, you are. / Yes, you are sympathetic. Is she coming? No. / No, she isn’t. / No, she isn’t coming. Are they married? Yes. / Yes, they are. / Yes, they are married. Was he nervous? No. / No, he wasn’t. / No, he wasn’t nervous. Were you visiting your family? Yes. / Yes, we were. / Yes, we were visiting our family. Has the statue been painted? No. / No, it hasn’t. / No, it hasn’t been painted. 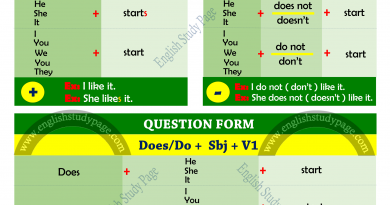 The verb “ Have ” has two forms in the present; have and has. The verb “ Have ” has one form in the past; had. ATTENTION:1. 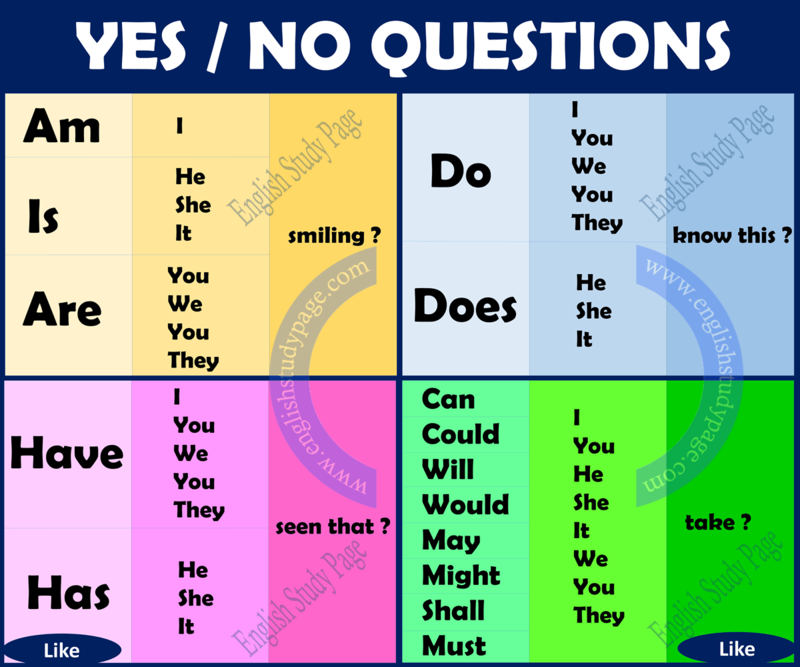 If we use “have” as a main verb in a sentence, we use “do” as an auxiliary verb to make negative and question sentences. 2. 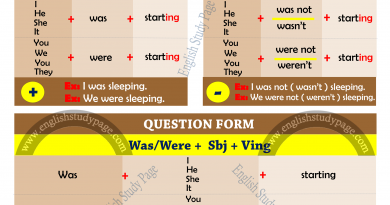 If we use “have” as an auxiliary verb ( especially before -ed (past participle) forms to make the present and past perfect tense ) in a sentence, we use “have” to make negative and question sentences. Have ( as an auxiliary verb ) + Subject + Main Verb + …. I have studied English. Have I studied English? He has finished his homework. Has he finished his homework? The film had started. Had the film started? We had locked the door. Had we locked the door? They have moved house. Have they moved house? Have you ever seen any rainbow? Yes. / Yes, I have. / Yes, I have seen a rainbow before. Have I met your family? No. / No, you haven’t. / No, you haven’t met my family. Has it been started? Yes. / Yes, it has. / Yes, it has been started. Had we sold our stock? No. / No, we hadn’t. / No, we had sold our stock. Had they been married? Yes./ Yes, they had. / Yes, they had been married. Has he stayed with us? No. / No, he hasn’t. / No, he hasn’t stayed with us. 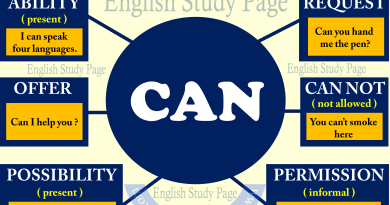 Modal + Subject + Main Verb + …. I may visit you tomorrow. May I visit you tomorrow? You can repeat it. Can you repeat it? She will pass the salt. Will you pass the salt? We should stay here. Should we stay here? They might come. Might they come? Can we get married? Yes. / Yes, we can. / Yes, we can get married. Would you like to drink tea? No. / No, I wouldn’t. / No, I wouldn’t like to drink tea. 2Might he come tomorrow? Yes. / Yes, I might. / Yes, I might come tomorrow. Should I clean my room every day? No. / No, you shouldn’t. / No, you shouldn’t clean your room every day . Will you sit down? Yes. / Yes, I will. / Yes, I will sit down. Could you tell me about yourself? No. / No, I couldn’t. / No, I couldn’t tell you about myself.